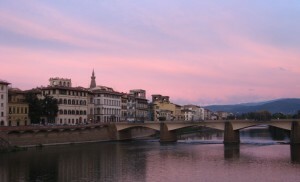 …or Florence, as the case may be, eat lots of gelato! At least that’s the rule we went by during our weekend in Tuscany. Rachelle, Rachel, Kirsten and I left a week ago today for our Italian adventure. Before our train that night I had a walking tour with my history class to see all of the places in Salzburg that have a connection to World War II or the Third Reich, and it was really strange to learn that some of the buildings we pass by everyday were sites of Nazi book burnings or SS prisons. Few of the buildings have any markers to indicate what they were, but most are so little changed that they are easy to identify from 1930s and ’40s pictures. Depressing. But shortly thereafter we were getting ready to board our 9:10 train. We all got a bit of a shock only a short while into the trip after Angry Austrian Train Man, his name as we refer to him now, yelled at Rachel for daring to put her foot up on the seat in front of her. German can be a frightening language as it is, so it shakes a person up when its being directed at you loudly. His outburst quickly became rather amusing though, and we played cards and chatted until we got to Villach, Austria were we needed to make a train transfer. From there to Florence we attempted to sleep, sprawled across our seats and squished on top of each other, but we all got at least a little rest before the train pulled up in Florence at 6:30 in the morning. Our hostel had asked us to confirm our early arrival time, so of course when we got there around 7 no one was around to answer the door. Someone finally came and, bleary eyed, politely inquired as to what the heck we were doing there. Confused, cranky that we were being dumped out into early morning Florence instead of being able to take a few hours nap, we left our suitcases with him and promised to return a few hours later. A snack at a cafe perked us up a bit, and we decided we might as well head to the Accademia Gallery, where the David statue is housed. It opened at 8:15, and we were first in line, so we had the whole place practically to ourselves for a time. The statue is one of those pieces of art we’ve all seen in textbooks since elementary school, so it was really cool to see it in person. We wandered through the rest of the galleries as well, oohing and aahing at the different statues. As the museum was getting more crowded we could feel our eyelids drooping and decided to escape to our now-ready hostel to take a quick cat nap. A few hours later we were far more ready to face the city. We grabbed sandwiches for lunch and hiked up to Michelangelo Plaza, a hill with a gorgeous view out over the entirety of Florence. So awesome. We hung around soaking in the view for a while, and then we explored a church on the hill that had a tangled maze of a cemetery behind it. We got some gelato and sat on the side of the plaza watching the sun get lower and a cute newlywed couple take wedding pictures with all of Florence in the background. By the time we hiked down from Michelangelo Plaze the sun was setting with a vengeance, and we were getting hungry. 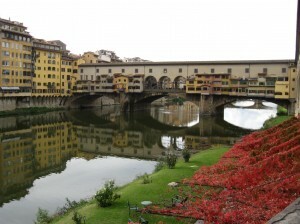 We took the time to stroll across the Ponte Vecchio, an old covered bridge that today houses lots of jewelry stores. Shiny. Dinner followed (pasta of course! ), and then it was more gelato. Yum. After our train ride the night before we were all falling asleep at 8, so we made it an early night and headed back to our hostel with the tiny creaky elevator and our room with no heat. Saturday morning we woke up in time to get to the Uffizi Gallery before it opened. We had been warned that it gets super crowded later in the day, and we wanted to make sure we didn’t have to climb over people to look at paintings. The gallery was gorgeous, full of Renaissance era artwork, most of which Kirsten was able to explain to us. We took a hint from Kirsten’s old family vacations and each chose something to count in the paintings. There were a lot of horses, but not enough to keep me out of fourth place. We must have seen virtually every painting in the place, and by the time we’d wound our way out of the galleries and through the endless Asian tour groups we were in desperate need of some lunch. Pizza seemed an appropriate choice, though resisting the temptation to pick it up and eat it with our fingers proved exceedingly difficult. We all ordered different kinds, and all were rather tasty. That afternoon we found the Florence street market, full of leather products and jewelry and t-shirts that said silly things in Italian. We went into the Duomo (the main cathedral) as well as some other churches. And I’m pretty sure we ate a lot of gelato, seeing as that’s all we ever did. We even had a rule that we couldn’t eat the same flavor twice, so between the four of us we tried just about everything. Ever since Budapest, Rachelle and I seem to have a knack for coming across random parades, and Florence was no exception. What we at first perceived to be an anti-tax protest turned out to be a mini gay rights parade. You go Italy. The parade worked its way down the street, and we found a little place to have pasta for dinner again that night before managing to discover an English pub showing American college football on TV. The half of our quartet who actually enjoys football found this entertaining. Sunday we woke up to rain and cold and not much left on our list of things to do. We finally discovered a place with cannolis (yet another food on our ‘we have to have while it Italy’ list) and sat eating those while waiting for the rain to stop. Of course, in keeping with the theme, a bizarre parade of Italian soldiers in uniforms ran by the cafe playing ‘Hava Nagila’ on their trumpets. Europe never fails to make me laugh. We then attempted to venture and find gardens that were marked on our map, but as it turns out the Four Seasons hotel had bought them and fenced them off, so alas, no gardens for us. Cold, and with our jeans wet almost to our knees, we stopped for cappuccino if for no other reason than that we were in Italy. This non-coffee drinker had to drown hers in sugar but drank it. Eventually we found ourselves at the Medici Palace, which you had to pay to get into, so we settled for taking silly ‘Singin’ in the Rain’ pictures with our umbrellas outside. Finally, finished exploring, we ate gelato yet again and then dragged our stuff back to the train station. We staked out a table in the back and proceeded to cover it in homework assignments as we attempted to catch up on our work while waiting for our 6:30 train. Of course it’s hard to concentrate when you’re freezing. 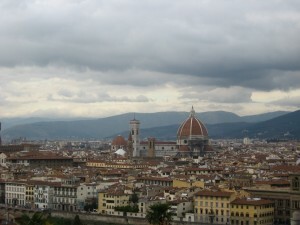 Florence does not believe in heating its buildings it seems. Several hours of shivering later we celebrated the fact that our train was not one of the many canceled ones that evening and piled on for the quick two hours to Venice. We had just enough to time to make our connection there, and then we were stuck for the long haul back to Salzburg. Poor Diego, our Italian compartment mate, was probably regretting his choice of train when the four of us showed up. I know I caught him talking about ‘quatros Americanos’ on the phone at one point, and if I knew the Italian word for crazy I probably would have heard that proceeding it. He was a good sport though, and the train ride went relatively quickly. Angry Austrian Train Man was back, but he was much friendlier this time, and when I woke up for a moment at a stop still in Italy it was snowing like insanity. We got back home at around 4 in the morning, and my German skills were tested when our taxi driver back to the dorm decided I should want to chat in a foreign language at that time of the morning. The whole trip was a blast though; it was a stunning city with lots of good food and lots of bonding time for the four of us. I spent most of this week stressing about homework because I had a big presentation for a class on Wednesday. I am all sorts of happy to have it over with. Yesterday too Rachelle and I had the fun adventure of searching out the Austrian equivalent to Draino so that we could finally fix our evil shower that refuses to drain. I’d really rather not ever have to empty a shower with cooking pots either, but luckily we were both amused enough by it that we didn’t take the time to consider how gross it really was. For the time being the problem seems to be solved. We made Austrian food for our weekly girls’ dinner last night, so that was fun. I met a girl from the second floor of our building who is from Columbia and only speaks Spanish and German but who wants to learn English, so it was quite the experience with all of us attempting to use a combination of Spanish, English, and German to communicate. Not much else too exciting though. We leave for Prague at the crack of dawn tomorrow. It’s supposed to be a spectacular city so I can’t wait to see it. Can’t quite believe we leave for home 5 weeks from today though; we’re trying to cram in everything we still have to see and do. Not to mention those three major research papers I still need to get a handle on.